[Latin America continues to elect regimes that are social-democratic and more independent of imperialism. Even so, we must understand that revolution is not simply a reform of current institutions. Revolution means a total break with the Old Power. It means rebuilding all of society, replacing Old Power with New Power. New Socialism and Leading Light Communism are about ending ALL oppression, breaking all chains, revolutionizing every aspect of our existence. Regimes that do not have such aims will never be able to really resist empire in the long term. 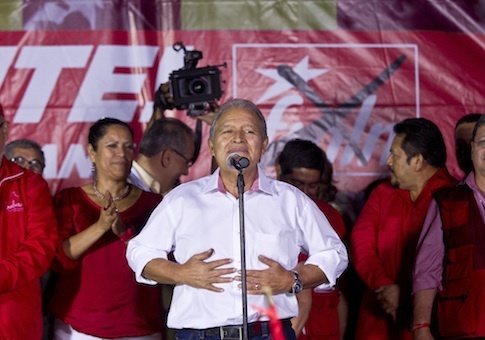 SAN SALVADOR, El Salvador (AP) — El Salvador’s electoral court on Thursday declared leftist candidate Salvador Sanchez Ceren the winner of the tight presidential election, making him the first former rebel commander to win the presidency of a nation where 76,000 died in a civil war. With all the votes counted, the electoral court announced on its website that Sanchez Ceren, candidate of the ruling Farabundo Marti National Liberation Front, the FMLN, got 50.1 percent of the votes. Norman Quijano of the conservative Nationalist Republican Alliance party, known as ARENA, had 49.9 percent. With about 3 million ballots cast in Sunday’s runoff election, Sanchez Ceren won by less than 7,000 votes, and Quijano’s party vowed to appeal the election until a new ballot is held. ARENA informed its members it had filed a complaint with El Salvador’s attorney general, where it is presenting evidence of fraud. So far it has not made any such evidence public. Outgoing President Mauricio Funes was a journalist who was sympathetic to the FMLN rebels during the 1980-92 civil war but was never a guerrilla, unlike Sanchez Ceren, who most recently served as Funes’ vice president. He said his role model is Uruguayan President Jose “Pepe” Mujica, who spent 14 years in prison during Uruguay’s dictatorship. A flower-farming former guerrilla, Mujica gives away 90 percent of his presidential salary, doesn’t have a bank account, drives a 41-year-old Volkswagen and never wears a tie. “Mujica is the example to follow, because he works on two main fronts: development and social investment,” Sanchez Ceren said. He has promised to maintain good relations with the United States, where hundreds of thousands of Salvadoran migrants live. Much like Mujica, Sanchez Ceren, 69, favors rolled-up shirt sleeves and usually eschews suits and ties. Close associates call him “Profe,” or “Teacher,” a reference to his beginnings as a grade-school teacher in a poor rural school. “In truth, at the end of the day, I’m a teacher, and my greatest pride is when people call me ‘Teacher,'” Sanchez Ceren said at a ceremony in February where he was given an honorary doctorate by the country’s National University. Sanchez Ceren was one of 12 children born to a carpenter and a food vendor. Once he started working, he quickly became an activist in the teachers union, pressing demands for better salaries and working conditions. Amid bloody repression of union leaders in El Salvador in the 1970s, he gravitated toward the rebel movement, then a series of leftist groups allied under the umbrella of the FMLN. By 1978, Sanchez Ceren headed into the mountains as an armed guerrilla, and by 1983 he became one of the rebels’ five top commanders, using the nom-de-guerre “Comandante Leonel Gonzalez.” He was seen within the movement as an advocate of dialogue, and he served as a negotiator in the 1992 peace accord that ended the war. “He is true to his revolutionary principles. He is a stalwart who is a life-long party member, but he is not stuck in the past,” said Miguel Montenegro, an official of El Salvador’s Human Rights Commission. Sanchez Ceren is likely to face continued resistance from emboldened activists of ARENA, which governed El Salvador for two decades before losing the presidency to Funes in 2009. Ernesto Muyshondt, ARENA’s vice president for ideology, said Thursday that there is strong evidence that members of the FMLN party engaged in double voting across the country. “We have testimonies, we have videos where people who work closely with FMLN talk about how they did it,” Muyshondt said. ARENA has filed complaints with the electoral tribunal and with federal prosecutors and has said it will appeal the results to the country’s Supreme Court. Sanchez Ceren also has to deal with one of the highest murder rates in the world. A 2012 gang truce seemed to cut the country’s daily average of 14 dead by half, but the drop appears to have been short-lived. Police statistics show 501 murders the first two months of this year, an increase of more than 25 percent over the same period of 2013.